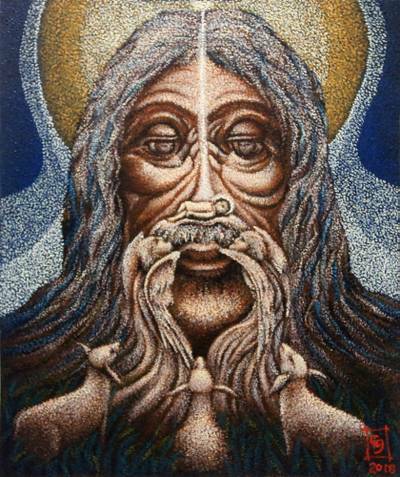 Signed Surrealist Painting of Jesus from Bali (2018), "Birth"
In a distinctive surrealist style, Balinese artist Candra Gunawan paints this intricate and impressive depiction of Jesus. Upon closer inspection, it is revealed that this painting not only portrays the face of Jesus, but that it is also made from several other figures. Joseph and Mary occupy Jesus's eyes, while his nose is made from baby Jesus, himself, held aloft by two angels. Three reverent sheep approach this majestic face. "I always had the soul of a painter." "My name is Candra Gunawan and I am a painter. I was born in Java in 1951 as the oldest of four children and had a very simple childhood. While my parents worked hard, they couldn't pay for my education and I attended only until the fifth grade. "I always had the soul of a painter. I was always interested in art. No one really taught me how to paint and I learned to create my own style through trial and error. My most difficult challenge is to come up with new ideas that are better than the ones before. "At 19, I began working at a batik shop. Years later, in 1985, I worked as a tee-shirt designer. "My wife is a great woman who unfortunately suffered a stroke in 2002. We have three sons and a daughter who make me very happy. I enjoy taking care of my fish and birds, and playing ping pong. "Someone once told me to accept whatever people say to you, even if their words might stab you in the back because, if we accept this with an open heart, their words might have a good impact on us. "I feel most at peace when I can accept any situations, both in good and hard times, and know that I am always watched by God."